There are some organizations out there where they’re willingly able to accept people to become a part of them. As these people become members of the organization, they gain access to different benefits and perks that are exclusive only to those who have decided to go the extra mile. You may also see sample application templates. However, one cannot just become a member of an organization without handing off certain information such as his/her name and anything else that’s required. Which is the exact reason as to why it’s important that these people fill out membership application forms and this article is going to teach you all that you need to know about them? If you’re the head of the organization, then you should know that a membership application form isn’t just any type of document, it’s basically a gateway into your simple business. Which is why it’s very important that you give off a good impression by ensuring that the application form is easy to fill out and find, while at the same time is both informative and welcoming to any person that wishes to become a member of your organization. The basic application form and process is also the means by which you get to know the prospective member and in turn, he/she is being formally introduced into your business. When you really think about it, the application form is one of the best documents that will represent that kind of organization you’re running. So if you have one that’s easy to fill out and can give applicants all the information they need? Then that will just tell them that you’re business is one that knows how to handle people well and that’ll make them want to join up even more. Although this has already been mentioned previously, you need to know just how vital it is that your application forms have these two aspects. This is especially true if you’re setting up the application form within your organization’s website as you want to ensure that the people who visit are able to navigate their way through it with ease. Make sure that the people can easily find it on the front page of the site, rather than having it buried somewhere deep where they’ll have to spend a lot of time and effort in finding it. 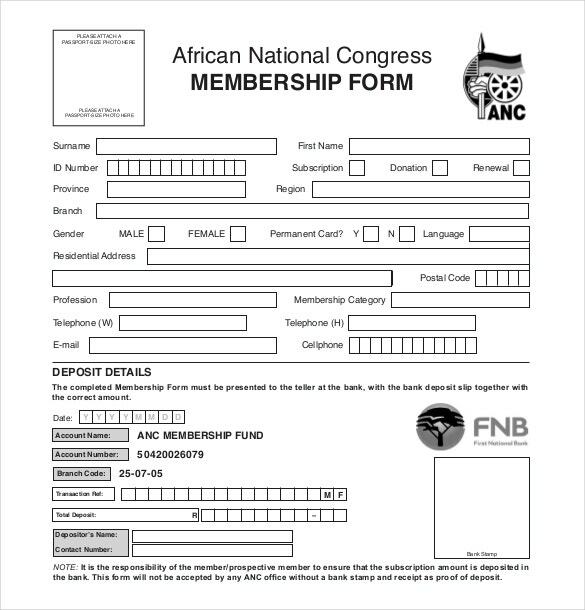 You may also see membership application letters. Also, to make the application process run smoothly, be sure all of the information needed to complete the form is close at hand. It can get frustrating if one has to go looking for the information needed to be able to complete the form. 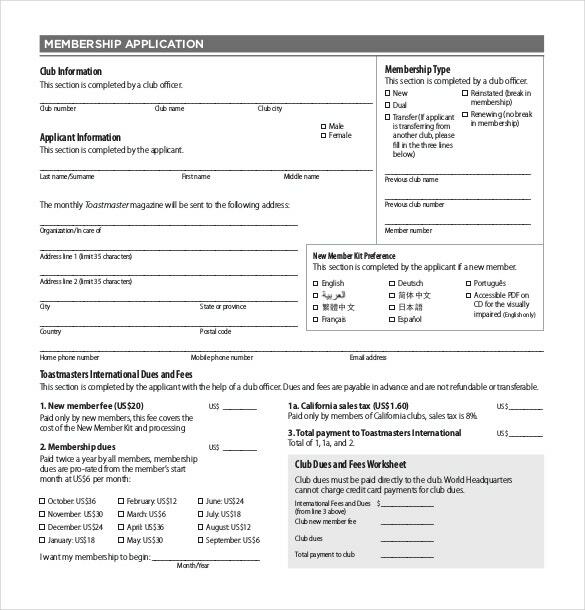 You may also see application form templates. Some organizations offer links to information right on the online form, while others have a “Membership” page on their website that includes a link to the form as well as other details about the membership such as the fees that need to be paid and the benefits that one gains. You may also see simple application templates. When it comes to how easy it is to complete the form, then you have to make sure that a prospective member struggles just to complete it. Which is the main reason as to why you want to keep the document as simple as possible? Be sure to offer clear instructions on the printable (PDF) form or on the screen for online forms. 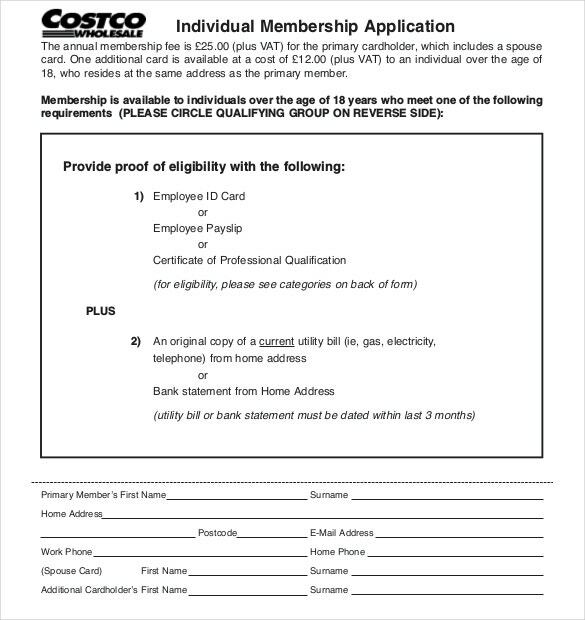 If you are using a Membership Management software program, then there should be a set of detailed instructions that will tell the applicant how to fill out the form. You may also see vendor application templates. 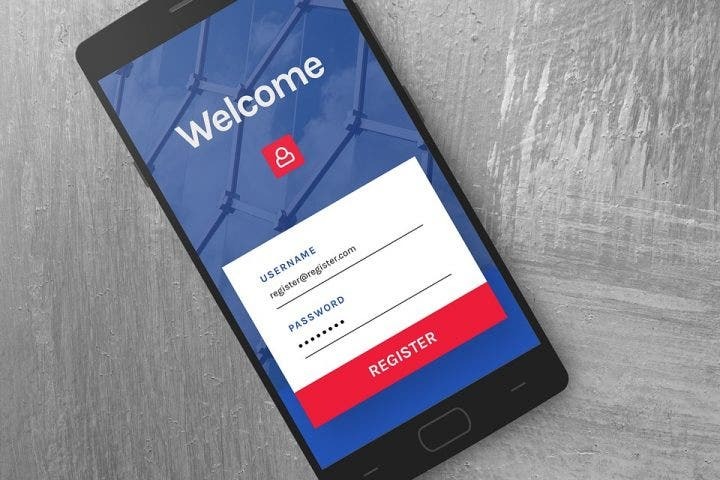 The key objective of your membership application form is to capture transactional information (that’s everything related to how the applicant is going to pay for the membership). So if you’re the one that’s in charge of creating the application form, then you’re going to have to put in all the spaces as well as provide details on what the applicant should provide in each of them. The challenge is finding a balance between gathering the information you need and providing additional details, while at the same time not making the entire process of filling out feel like a daunting task. You may also see free application templates. If it’s been a while since you looked at your membership form or if you’re still making one, then try to take a good look at it. Try to focus mainly on how it looks and what it’s in it. So ask yourself, do you think that the document looks good? How does it sound when you read through it? 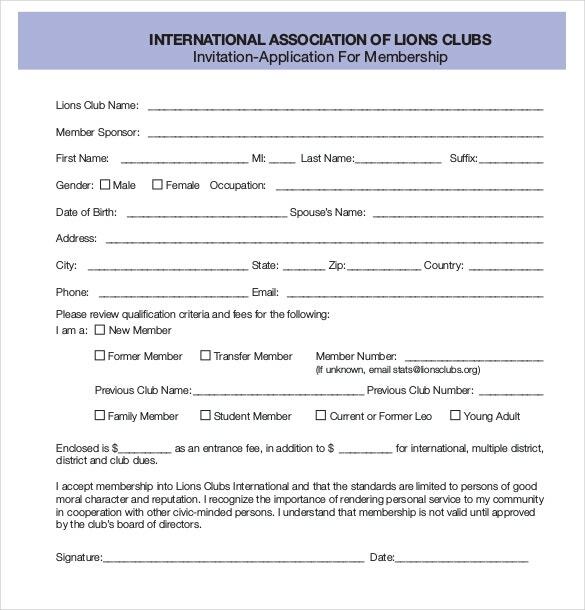 As noted earlier, the prospective members’ first impressions can be critical, so you have to make sure that your membership application form appeals to the people that wish to sign up as well as being easy to complete. What helps people decide if they want to become a member of your organization is how well the website is developed and if the application form is easy to find and complete. That means it’s possible that your prospective member will make up their mind about joining or registering within a few seconds of being on your “Join Us” or Membership page. When these people take on your online membership application form, it only takes a couple of seconds for them to decide as to whether they want to keep pushing through our not. If they see that the form is too complicated or looks as if it’ will take up a lot of their time, then chances are they won’t push through. A good, clean design can definitely get these people to keep going to try to focus on that. You may also see application samples. Divide the form into different sections where you group all of the relevant information together. Along, an unending page of type can look daunting, so you can avoid that by dividing the form into different sections. One way to do this is by utilizing bold headings to separate each of them into different group fields. Some online forms enable you to do a multi-stepped process, which moves the applicant from one page or section to another so that they don’t feel as if they’re filling up one long and never-ending form. Then there are those who make use of bold and colorful headings to draw the attention of applicants to the next section. Just try to go with what you think will work best for your organization and with your prospective members and remember that the point is to make it easier for them. You may also see job application templates. Communicate your organization’s personality through the typeface, color, and graphics. If you’re a community organization or networking is your strength, then you would want to go with a design that’s more friendly rather than formal. You could consider including color or graphics to catch the applicant’s attention and show that your organization is one that’s willing to welcome anyone with open arms. You may also see employment application forms. Be sure to make it as user-friendly as possible. Completing forms is never a fun thing to do, which is why you have to do everything possible to make it easier for them. One good way to do this is by providing them with checkboxes that will allow them to go through pieces of information that they have to put int the form without actually writing it down. If it’s for an online form, then offer to drop down menus and pre-filled answers so that your applicants can speed through the process. You may also see job application form in recruitment. Use a concise, but a friendly tone of voice. Like color and graphic style, the tone of your application form should match with the kind of people that are going to be applying for membership in your organization. But whether you choose a casual, light-hearted tone or a more formal voice, you have to ensure that the questions you ask are all positive. While it’s important to include any membership criteria, you still have to make sure that they’re all stated on a positive note so that these people will be more inclined to join up. You may also see HR application forms. Completing a membership application can be a time-consuming chore, so you should offer options that make the process as quick and easy as possible. Do you think that people will benefit more from signing actual application forms that are printed out in sheets of paper? Do you think it’s better that they do everything online? Or is it possible for your organization to provide both options to them? It’s your responsibility to know which method you should go with that will benefit both your organization and your prospective members. You may also see the significance of lease applications. However, a majority of the public nowadays would rather have everything is done online. The reason? It’s because they’re able to do it whenever and wherever they please and they don’t have to go through too much hassle just to do it. While this benefits applicant, it also helps out the staff or volunteer members of the organization when it comes to managing every single membership. You may also see application for employment form. Once the applicant hits the send or completion button on your online form or sends in their application by mail, they expect their members to be active as soon as possible. But in reality, it truly starts with their confirmation email or letter. So it’s important that you confirm the membership and then you can start welcoming them into your organization. You may also see teacher application forms. Most membership management systems offer automated email welcome/confirmations that you can customize in whatever way you wish. Be sure that you change it in a way that will match the feel you want to give off to the people you want to invite as members. Take the opportunity, both on the form and in the confirmation email, to demonstrate what your organization is all about and the kind of benefits these people will get the very instant that they become a member. Give these people the warmest welcome possible so that you can start developing trust right from the start. If you would like to learn more in regards to how you should go about in creating membership application forms or anything related to this particular topic, then all you have to do is go through our site, find the articles that have the information you need, and utilize what you’re able to gather to help you out. You may also see apprenticeship application forms.